Professor Ernest B. Berry taught weaving and designing to senior-level students in the late 1950s until his retirement in 1969. One of the looms available in the jacquard laboratory on the first floor of Nelson Building was a narrow-fabric loom capable of weaving a two-inch wide tape. 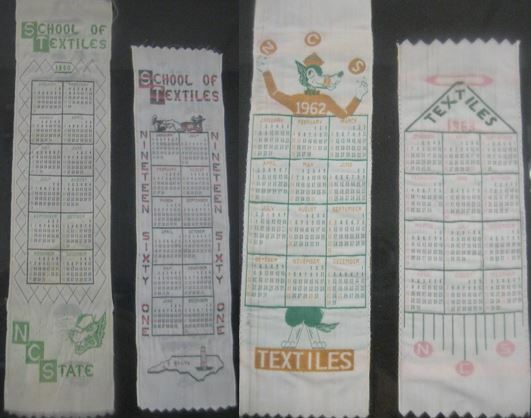 In the fall semester of 1959, Berry challenged his students to design and weave a bookmark calendar with a School of Textiles design in the top two inches followed by the twelve months positioned two by two for the next five inches. The winning design resulted in a green and white calendar assembled with surplus Fortisan (a regenerated cellulosic filament yarn) as the warp and acetate as the filling. The calendars were such a hit with the members of the class, faculty and staff, that the project became an annual event. (1, p105) Much later, in 2016, a member of the class of 1959, William C. (Willie) Bowen, remembered that very project. Willie was the winner of the first contest- he included a “trademark” on the bookmark – inside the eye of the wolf is the NC State block “S” logo (2). 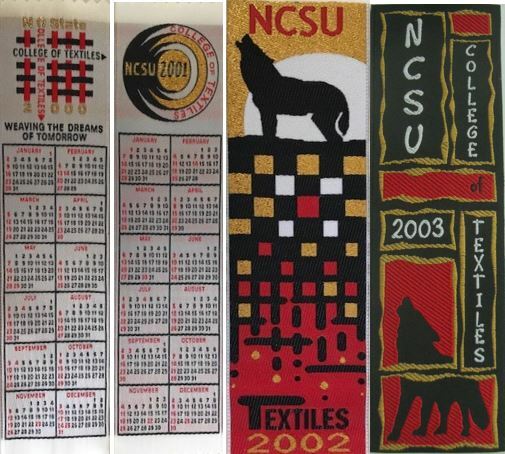 In 1961 and ensuing years, under the supervision of Professor Berry, calendars were woven with black, red and white yarns featuring the N.C. State colors and the wolf mascot. Designs occasionally incorporated blue, gold, and a few other accent colors. In the 1960s, polyester warp came into use. Upon the retirement of Professor Berry in 1969, designs for the increasingly popular tapes continued to be solicited from senior-level weaving and design students. In 1999, as the college prepared to celebrate the 100-year anniversary and assemble a collection of these tapes, no tapes were found for the years 1968, 1970, and 1972. This was a transition time from Berry to Professor Joe Porter, who took over and reenergized the program. The designs often reflected the commemoration of a textile fraternity or a special event. Delta Kappa Phi textile fraternity was featured on the 1969 calendar. The Phi Psi – Eta Chapter textile fraternity was featured on the 1971 design. The 1974 NCAA National Championship for men’s basketball was commemorated in the 1975 tape, which featured a wolf dribbling a basketball. Patriotism for the United States Bicentennial celebration resulted in an American eagle design with “1776-1976” and the addition of accenting blue and gold yarn along with the traditional red and black yarn. The 1979 tape featured a wolf sitting behind an old fashioned spinning wheel (1, p141-42, 3, 4). The designs for of the calendar tapes for the 1980s tended to be stylistic. A 1982 calendar featured a triangle and “NCSU Textiles.” A cotton boll, test tubes, and a yarn package were chosen for the 1983 design. The 1984 tape commemorated the 1983 championship for men’s basketball with a wolf and basketball featured. In 1986, the theme across the United States Textile Industry was “Crafted with Pride” and “Crafted with Pride in America”; the college responded with “Crafted with Pride by NCSU Textiles.” In 1987, the university celebrated the centennial of the authorization of a new school to teach agriculture and the mechanic arts. North Carolina College of Agriculture and mechanic Arts opened classes in 1889. The 1987 design showed the letters “NCSU” interlocking with “100” and “1887-1987” in gold lettering and “Textiles- Designing a New Century” over a pattern of bricks and large 1987 lettering in red. The “Crafted with Pride” red star logo was also used. Michael Hamby (B.S. Textile Technology 1970) of Hamby Textile Research Laboratories collected tapes when he was a student and continued through the late 1990s. He began commissioning his own set of tapes for his business. When Hersh collected for the Museum, Hamby confirmed that he had not been able to collect tapes from 1968, 1970, and 1972. When Professor Porter retired in 1978, Professor Mansour Mohamed took over supervision of the designs until the early 1980s. Professor R. Alan Donaldson became the Design Professor in 1976 and picked up where Professor Mansour Mohamed left off. Professor Donaldson solicited designs from his freshman design students. The best designs were forwarded to the dean, and a panel selected the most appealing design for the coming year. (5) The proposed College of Textiles for Centennial Campus was featured on a 1988 design. 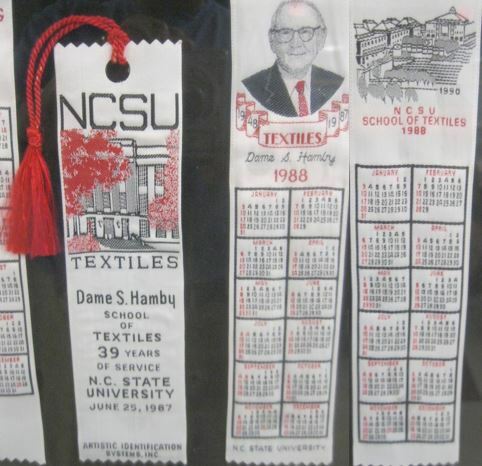 The retirement of Dean Dame S. Hamby brought honor for his service to the textile school from 1948-1987 with a special tasseled bookmark design and with a second design of the Dean himself for 1988. 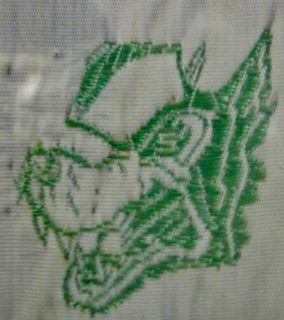 The various degree programs were featured in 1989 with the words, “Design, Management, Apparel, Chemistry, Science, and Engineering” encircling the wolf head. The NASA-sponsored Mars Mission Research Center and a Lunar Lander were featured in 1990. The 1999 design featured “1899-1999 – Century of Progress.” Professor Emeritus Sol Hersh presented his personal collection of 32 tapes from 1967 to 1999 to the College early in 1999. This collection was mounted and framed for exhibition and forms the nucleus of the current collection. (1, p221-222) Additional tapes collected by Hamby were donated to the College and were integrated with a display of all known tapes outside the Dean’s Office. Professor Donaldson continued to solicit designs from his freshman design students and even opened the competition to others when interest flagged. Each year he sent designs to the dean. Dean Robert Barnhart retired in December 1999 and was succeeded by Dean A. Blan Godfrey who continued the tradition of authorizing annual tapes. The calendar soon disappeared from the design in 2002 as wristwatches with the current date became fashionable. This also allowed for a more expansive design. The 2004 bookmark is based on a series of the red, white, black and green College of Textiles swoosh logo adopted in 2003. The 2017 bookmark appeared with a design commemorating the Fifty –Year Anniversary of the Carter-Finley stadium, celebrated in 2016. The winning design showed the green field and thousands of fans at the stadium using burgundy, black and white flecks. This may be the first design without Wolfpack Red yarn since the very first bookmark. Mock, Gary, N. A Century of Progress, The Textile Program, North Carolina State University, 1899-1999, North Carolina Textile Foundation, Raleigh, N.C., 2001, pages 105, 141-42, 180-82,221-22, 221f, 224. Hersh, Solomon P., personal communication 1998, 1999. Hamby, Michael, personal communication 1999. Donaldson, R. Alan, personal communication, 1999, June 2017. Powell, Nancy B., personal communication, June 2017.